Back into the sea. Yesterday we did a trip to Octopolis, the octopus observation site I’ve written about here many times. We arrived at the site and found three large carpet sharks (Wobbegongs) sprawled next to and on top of it. We’ve seen this before. When the sharks are present, we find very few octopuses, and they keep their heads down. Four octopuses could be seen at the site yesterday, which is not bad, but less than a third of what we’ve seen there before. Wobbegongs are supposed to be placid animals, but they do have teeth and there’s only so close I want to get to a 7 foot shark, so they make detailed observation of the site just about impossible. As a result, yesterday we did a few quick counts and went off looking for other animals, including the two above. 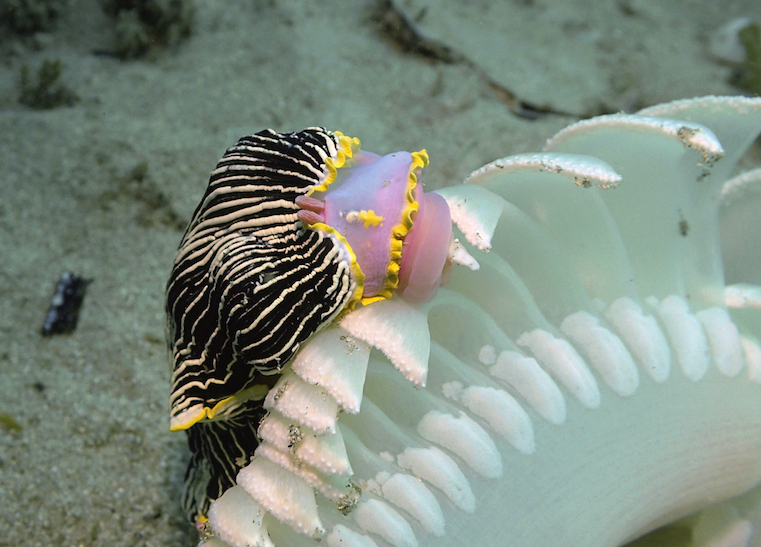 This is a nudibranch of the Armina group (I’m not sure about the species), eating a sea pen. It looks like a molluscan attempt to consume the Sydney Opera House. The little vertical pink stalks at the front of the animal are its rhinophores, with which it senses chemicals in the water. 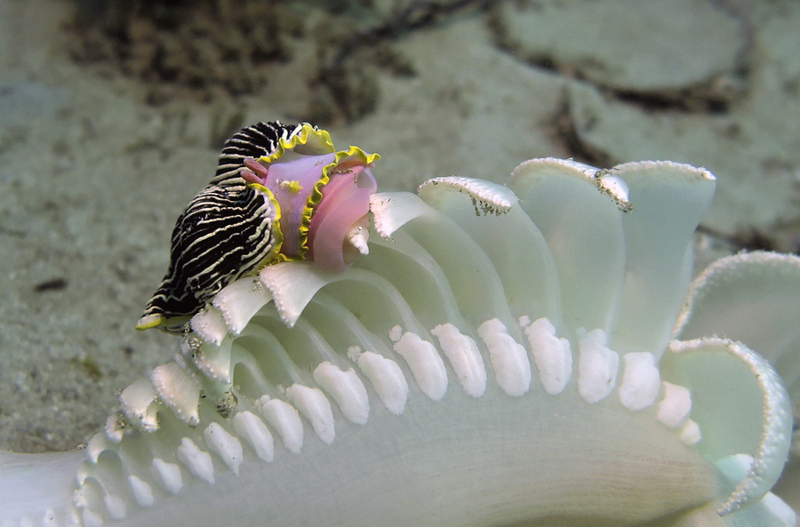 The feeding apparatus, that fat ring-like object in contact with the sea pen, is something I’ve not often seen. 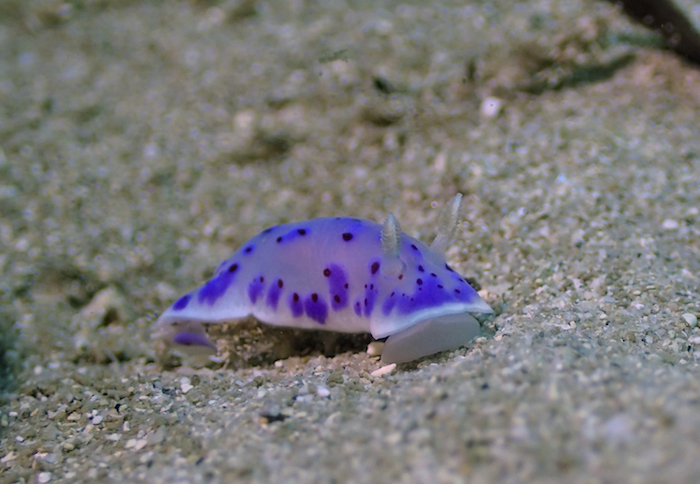 Here’s another nudibranch from yesterday, though, also showing the feeding parts. I think this is Chromodoris thompsoni. Some more thoughts about the octopuses and sharks: The first time we saw sharks lying on or near the Octopolis site was at roughly the same time of the year (August) in 2013. We’d come prepared for a detailed study of octopus behavior, and the sharks caused quite a few problems for that project. They did, however, become part of another side of our research, which looks at the ecology of the site and how it changes over the years. We wrote a paper about this in 2014. When we saw the sharks there in 2013, our initial thought was that this might be a permanent change. The octopuses at our site seem to have built an ‘artificial reef’ by bringing in thousands of scallops and discarding the shells. As we documented in our 2014 paper, many kinds of fish and other animals are now much more abundant on and above our site than they are outside it. So our thought was that the octopuses had built a reef, this had attracted a lot of fish, and the sharks had followed and taken up residence. Our cameras caught some video of a Wobbegong doing an ambush lunge upwards into a school of fish. We feared that the sharks would suppress the octopus numbers, and our research might have to wind down. Here’s a shot from yesterday of one of the sharks lying right on top of some former octopus dens. That’s his head on the right. However, the sharks and the decline in octopus numbers did not turn out to be permanent. In February 2014, when I was next at the site, the sharks had gone and the octopuses were recovering. By December of that year the octopus numbers were larger than I’ve ever seen there – over a dozen. Since then we’ve seen a general pattern – not a very neat one – in which there are fewer octopuses in the winter than the summer, and the wobbegongs have been seen only in autumn and winter, never summer. (I will check that ‘never’ again to make sure.) Yesterday all this had me thinking about the causes of change at the site, especially the different processes that might be operating. Our 2014 thinking was based on just one shark-invasion event. Now a bit more time has passed. One possibility is that the seasons are having a regular effect. In winter there are fewer octopuses and more sharks. These might be two independent phenomena, or it might be that winter brings sharks and they eat the octopuses. If so, we might expect this to continue year after year. You might see this pattern extending back into the earlier years of our surveys (see here), but it’s a messy pattern in those years if it’s present at all. 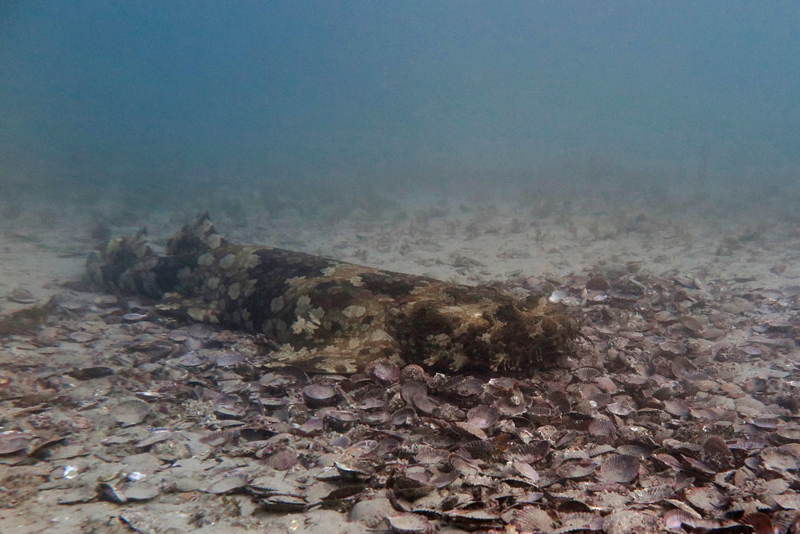 When we first saw the Wobbegongs at the site, in 2013, the view we considered was not related to seasons. We thought, as I said, that the octopus’ “ecosystem engineering” had attracted fish, which had in turn attracted predators, and this might be the end of the site as a hive of octopus activity. This would be a case of “ecological succession.” At each stage, each collection of organisms at the site gives rise to new conditions and new interactions, ending in a stable state. The processes of change in that case are not due to seasons, or other large-scale causes coming in from the outside, but due to a sort of internal dynamic, where stage A generates B, and B generates C, and so on. A distinctive feature of the Octopolis case, though, would be that this “succession” process could include a cyclical element, a loop. Suppose the octopuses bring in shells that create a reef-like habitat in an otherwise barren landscape, fish and other animals are attracted to the site and come to live there, and large predators then come to eat the fish and also eat a lot of the octopuses. If that happens, the octopuses would no longer maintain the site by bringing in new shells. In this environment, the silty sand eventually covers up whatever is on the surface, and objects of any weight tend to sink in and disappear. So if the octopuses are driven out, the reef will not be maintained, and it will shrink away. The fish will leave – as this patch is now no different from any other – and the predators will follow. Then, perhaps, the few remaining shells and other objects might provide an attractive habit for a couple of octopuses…. This entry was posted in Octopus. Bookmark the permalink.